It all started so simply…I was looking for a birthday gift for a friend. She does some gardening and is always looking to eat healthier so I went to a few of my favorite online shops and searched Gifts For Gardeners to see what came up. 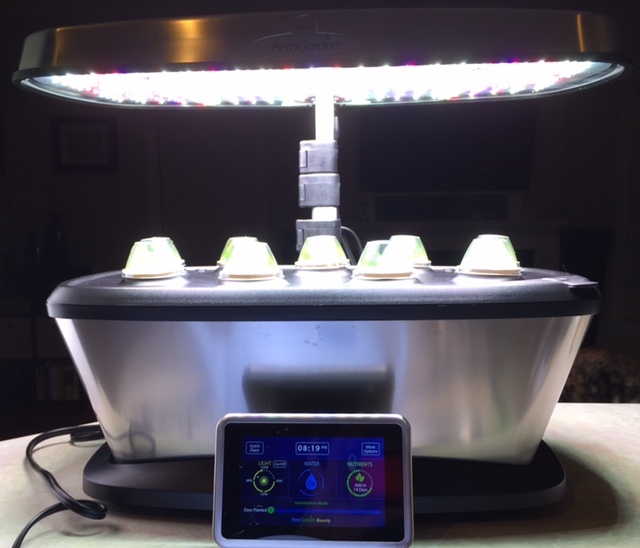 What came up (over and over) were the counter-top, hydroponic growing contraptions that promise fresh herbs, greens and veggies faster than their soil bound counterparts. The reviews spanned the positive to strongly positive and some of the user videos showed amazing results. I have been resistant to the idea of hydroponics because it is not a natural system and doesn’t even attempt to mimic a natural system. Food plants grown hydroponically are not dining at the full banquet of known and unknown plant (and human) nutrients, minerals and components found in organically rich soil, but instead are fed a simplified diet of nitrogen, phosphate, calcium and magnesium diluted in water. What does that mean for the creatures that are eating them? But there is the not-so-small matter of having fresh herbs to cook and garnish with through the winter months… Many of my outdoor herbs are still doing very well, though my beloved basil is already beginning to look pretty rough and with fall officially here, some of the others will begin to say good-bye for 2016 in the coming weeks. This is the time of year I usually begin my indoor herb garden in the dormer nook upstairs as a stop-gap measure to cover the basics (basil, rosemary, oregano, cilantro) until they can be sown outdoors again. Overall, my indoor herbs usually do pretty well each year in their little corner of the house, though they do have to cope with occasional fungus flies, aphids, powdery mildew outbreaks and a water deficit when I travel. The more I considered it, the more it seemed that growing a mix of fresh herbs through the winter months right on my kitchen counter, right where I cook and where I can be a bit more attentive on a day-to-day basis, even if it is hydroponically, is maybe not such a bad idea. Herbs are especially dense on flavor and hopefully will not have a watered down taste. Enter the AeroGarden for my friend and myself. 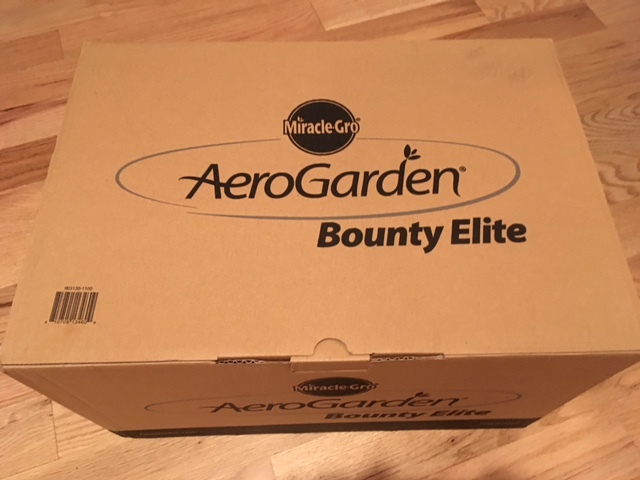 I opted for the Bounty Elite from William Sonoma because it has the most space for plants (up to 9 depending on variety) and the LED light can raise from 15″ to 24″ as plants grow. I have to admit, I was impressed by the touch screen display that shows days since planting, days until nutrient add and monitors and alerts for water level. 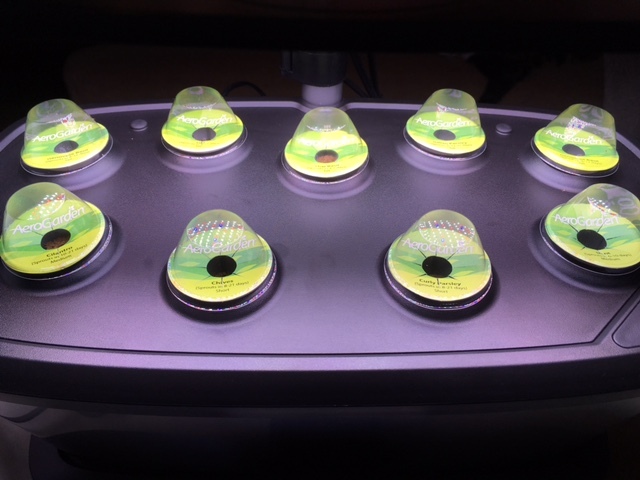 It is programmable by plant group being grown (herbs, tomatoes, lettuce, peppers, flowers, etc). If you happen to have kids under the age of 10 in the house, the space age looking pod domes are an added bonus. So I am taking the plunge, I hope this particular horticultural/culinary experiment works out well – if the herbs I am growing are as robustly flavored as their soil bound brethren, it will mean my indoor garden upstairs is relegated to spring seed starting and even more herbs are making into everyday meals than they already are. Updates to follow! This entry was posted in Herbs, Hydroponics, Indoor growing, Inventions, Kitchen Implements, Non-GMO, Technology. Bookmark the permalink. Keeping an eye out for your updates!